You are currently browsing the tag archive for the ‘Joe Grant’ tag. ‘Parade of the Award Nominees’ was especially made for the fifth Academy Awards gala night of November 18, 1932 to introduce the nominees for best actors and actresses. The short is based on the opening parade of ‘Mother Goose Melodies‘ (1931), and reuses quite some animation from the original Silly Symphony, but this time it features Mickey, Minnie and Pluto, all in their color debut, predating their official color debuts in ‘The Band Concert‘, ‘On Ice‘ and ‘Mickey’s Garden‘ respectively by three years. Thus, their color designs are a bit different: Mickey wears green shorts instead of red ones, and Pluto is a sort of grey-ish, instead of orange-brown. Following Mickey, Minnie and some characters from the original ‘Mother Goose Melodies’ we watch the following Hollywood stars parade: Wallace Beery as ‘The Champ’, Lynn Fontanne and Alfred Lunt (both starring ‘The Guardsman’), Helen Hayes (‘The Sin of Madelon Claudet’), Fredric March (‘Dr. Jekyll and Mr. Hyde’), transforming while walking, and finally Marie Dressler (‘Emma’). The caricatures were based on designs by Joe Grant, who, at that time, was still working as a newspaper caricutarist. Grant was only hired later, for ‘Mickey’s Gala Premier‘, which premiered eight months later, and which features many more caricatures of Hollywood stars. Incidentally, Fredric March, Wallace Beery and Helen Hayes won the Oscars. ‘Lady and the Tramp’ is a mild and friendly film based both on story ideas by Joe Grant that went as far back as 1939, and a short story by novelist Ward Greene. It tells the story of Lady, an upper class female Cocker Spaniel living around the turn of the century. ‘Lady and the Tramp’ was the first animated feature in Cinemascope. The film uses the new technique to great effects, with the action carefully laid out to the broad screen. Its backgrounds are very beautiful, and remarkably lush or, when necessary, highly dramatic. Only in the love scene they become somewhat stylized, showing a Mary Blair influence otherwise absent from the film. The high quality animation is a delight to watch and stands out in an age of stylized and limited animation, something the 1950s more and more became to be. Like the animals in ‘Bambi‘ (1942), the dogs have a look and feel of real animals, while, at the same time, being full characters one can relate to, with a complete range of human expressions. Even the minor characters, like the dogs in the dogpound, are perfectly animated in that respect. The voices help in this dualism, often being a combination of human and dog-like sounds. The humans, on the other hand, are hardly seen, and only the strongly caricatured ones, Aunt Sarah, Tony and Joe, have something of a character. It is telling that the most famous and probably most romantic kiss in animation history can be seen in this movie and is a kiss between two dogs. 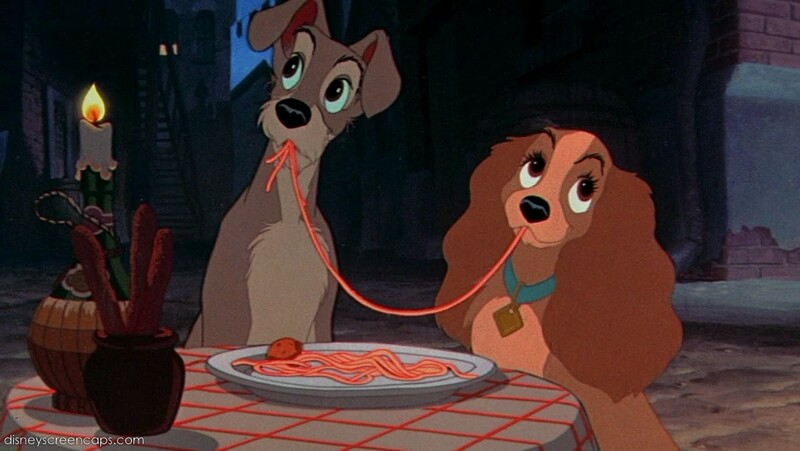 In this scene Lady and the tramp share a meal of spaghetti, accompanied by romantic music by the two Italian restaurant owners. This scene, animated by Frank Thomas, is the undisputed highlight of the film. Honorable mention goes to the very lifelike fight between the tramp and a large rat, a strongly dramatic scene animated by Wolfgang Reitherman, which can compete with the fighting scene in ‘Bambi’ in its impact.